Lighthouse went straight to the source and asked managers of large facilities what problems were ailing them. They found that, even though the industry was large and robust, businesses were having huge problems understanding their assets and operations. Managers agreed it was often difficult to know where people or assets were located. As a result, they couldn’t determine whether they were really meeting client KPIs like cleaning rotations and security checks. Their systems were inefficient and very low on data, making it difficult for managers to make any kind of informed decisions. Lighthouse replaced traditional tick sheets and paper forms with beacon-leveraging mobile apps. This immediately gave businesses a real-time view of their workforce. Workers within range of beacons in shopping malls, airports, train stations and corporate offices, are immediately recorded and updated to a map view in the management console. Moreover, if a worker fails to arrive at a location at the specified time, an “exception alert” can tell the manager what’s happening. This had a huge impact on the many companies using legacy technologies like RFID wands and QR codes. First, while RFID wands require employees to tap wands to fixed readers, beacons operate in the background, tracking activity without the need for manual intervention. Second, Lighthouse’s customers were happy that beacons were far cheaper than other technologies as RFID readers generally cost $1,000-$5,000 while beacons cost some $10-$30. On top of this, beacons’ ability to work passively means they automatically register movement and are tougher to deceive. Finally, as the beacons already communicate with users’ smart devices, there are infinite possibilities for integration and extension. Spotless is a leading integrated facilities service provider in Australia. Spotless teamed up with Lighthouse to install over 500 beacons in shopping stations, train centers, and airports. These beacons used a 20-minute loop time to register whether the area had been serviced. If a cleaner didn’t enter that zone within 20 minutes, the staff member and supervisor were alerted via the Lighthouse.io mobile app. 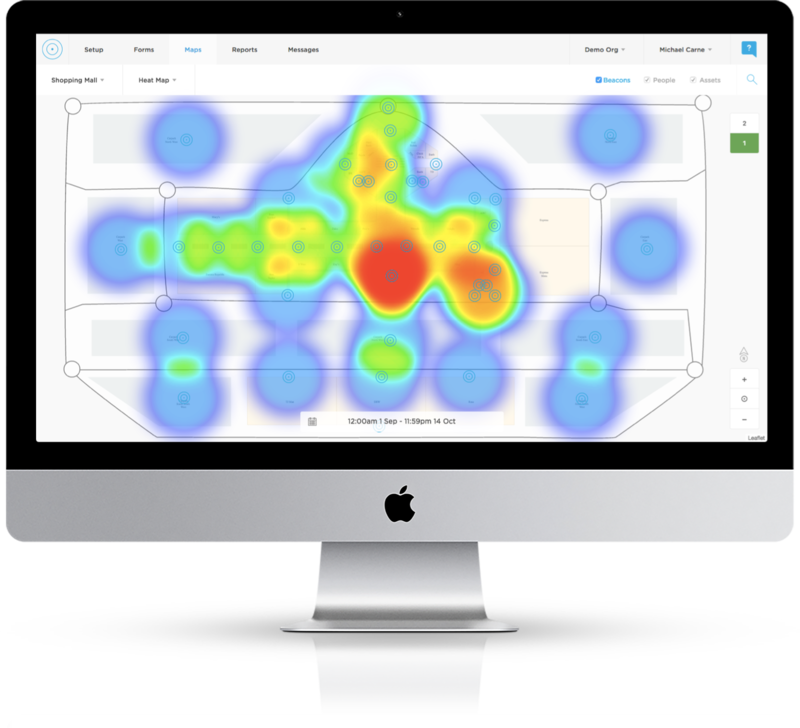 Spotless is now able to create heatmaps to find underutilized or overutilized zones, creating better efficiency. The data also enables them to quantify results and express KPI performance.